Doomtown is an expandable card game set in the Deadlands™ universe. Based on the classic collectible game, Doomtown Reloaded is a fast-paced game of gun slingin’, spell slingin’ and mud-slingin’! Use poker hands and card pulls for everything from gunfights to summoning abominations. 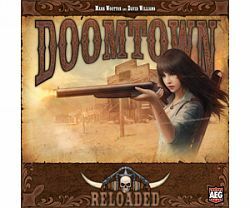 Doomtown Reloaded puts you in charge of one of the four main outfits vying for control of Gomorra: The Law Dogs, the Sloane Gang, the Morgan Cattle Company, and the Fourth Ring.